Dear Total German Shepherd.com: I've been meaning to send in a picture of my beautiful GSD, Anakin, for months now, but "stuff" kept getting in the way. I look forward to your monthly emails, because I enjoy seeing all these lovely creatures. 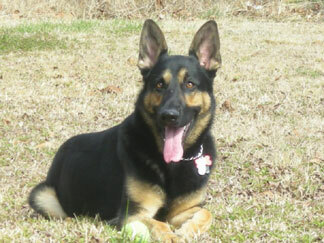 Anakin is a 2 1/2 year old GSD that was purchased from a North Carolina breeder as an early birthday present for my son. I have always loved dogs and have owned several different breeds during my life. Anakin has completely run away with my heart, and I cannot imagine a breed more suitable for our family. He is protective, loyal and loving. This past fall, I found a lump in my breast and I was just devastated. As a single mom, I worried about my son's future and obsessed over what would happen to him should anything happen to me. During that entire experience, Anakin stayed beside me - trying his best to bring a smile to my face. Even though he required my care every day, I can truthfully say that Anakin took care of me! He stuck by me, through sleepless nights and surgery, and reminded me to be strong. The lump was benign, and I thank God for pulling me through that difficult time. If it had not been for Anakin, getting up & facing each day would've been a struggle. He was my rock. I am now sold on German Shepherds! Their loyalty and intelligence makes them soar above the rest. Thank you for your website and all that you do to reveal the beauty of these magnificent dogs!! You story is so true of German Shepherds. As I read it tears started to fall from my eyes. I am so glad for the good news you received and everything will be fine, but as you said there would be sleepness nights and times that GSD know just what is needed. God gave us a bit of heaven when he gave us German Shepherds especially but all dogs. After all dog is GOD spelled backwards so we know they are very very special.